The final day of our brief trip. 🙁 We had to be at the airport by 2.30 pm, so that gave us time to finally get to the Adelaide Botanic Garden and do a bit more wandering and geocaching before we would need to get going. We checked out, took our bags to the car, then made our way to Rundle Street where we found an open cafe for breakfast. It was rather slow in coming and service was not the best, however the coffee was good and we were fed. We continued down Rundle Street as it would get us where we were going and as Scott had mentioned there is a market on Sundays. The market wasn’t great – maybe Salamanca spoiled us or maybe the dreary weather was keeping stall holders and punters away? And then we arrived at the Adelaide Botanic Gardens. As I’ve mentioned before, Scott, his mum, his sister, and his brother-in-law were locked in here October. They didn’t know the closing time and were just wandering around enjoying themselves and wondering at seeming to have the whole place to themselves. There was a reason! So they decided to jump the fence. Yes, Scott’s mum – in need of a hip replacement and laughing at the situation they were in – had to jump it to. So of course they bumped into one of the nurses they knew from the ward Scott’s father was in! Being a Sunday morning, we didn’t have this trouble. Scott had three goals in mind: to visit the Palm House, the Amazon Waterlily Pavilion, and the Bicentennial Conservatory. The first thing that took my eye when we entered was an odd looking metal and brick thing. Upon further investigation this plaque reminded me of my friend Corri: ‘Erected to the Memory of Elvis Presley by the Sounds of Elvis Society 26 November 1982. Opened in 1877, restored in 1995. An exquisite restored Victorian glasshouse imported from Bremen in Germany in 1875 and thought to be the only one of its kind extant in the world. 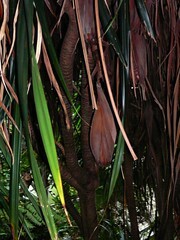 Features a display of Madagascan arid flora. Imported from Bremen, Germany in 1875 by the second Director Dr Richard Schomburgk, the Palm House was opened in 1877 and has been a focus in the Adelaide Botanic Garden since that time. 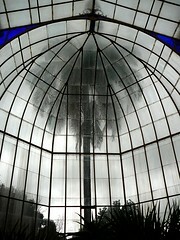 It was designed by German architect Gustav Runge, the sophisticated engineering techniques used in its construction making it a benchmark in glasshouse design. 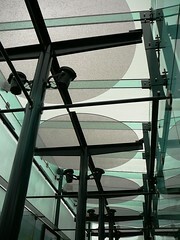 The hanging glass walls are similar to those used in modern city buildings today and were very advanced for the time. This sophistication and Adelaide’s dry climate probably account for the Palm House’s survival with a remarkably high degree of originality. 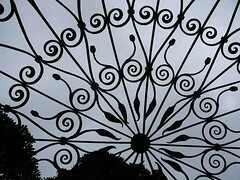 In 1986 corrosion of iron glazing bars in the Palm House made it unsafe for public use and it was closed. 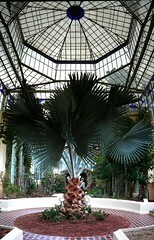 A conservation study carried out in early 1991 recommended a full restoration programme, and in February 1992 the Board of the Botanic Gardens launched the Palm House Restoration Appeal to raise funds to enable this to proceed. 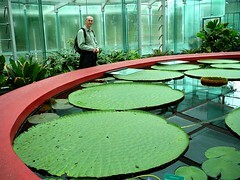 South Australian Premier Mike Rann officially opened the $4.3 million Amazon Waterlily Pavilion on 7 November 2007. 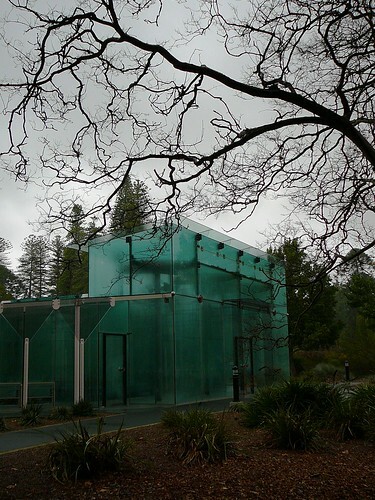 The Pavilion, the third of Adelaide Botanic Garden’s glasshouses, is an exquisite glass palace setting for a jewel of the natural world and indeed the Adelaide Botanic Garden’s – Victoria amazonica. 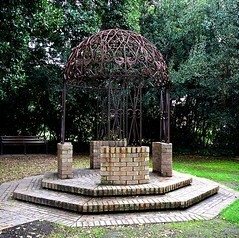 The pavilion was constructed as part of the Gardens 150th Anniversary in 2007, as was the Schomburgk Pavilion and the SA Water Mediterranean Garden. 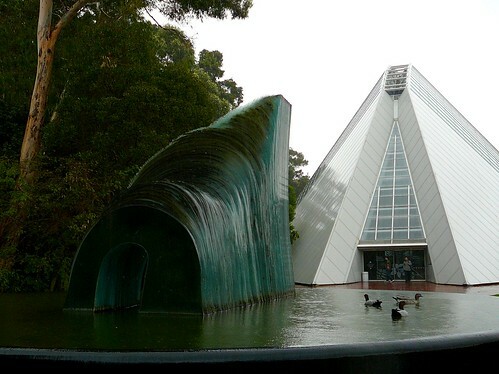 Built to celebrate Australia’s Bicentenary (1988), the Bicentennial Conservatory in the Adelaide Botanic Garden is the largest single span conservatory in the southern hemisphere. Designed by South Australian architect Guy Maron, the building is curvilinear in shape, 100 metres long, 47 metres wide and 27 metres high. 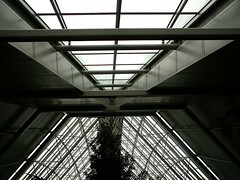 An elegant steel superstructure supports the 2,434 metres2 of toughened glass which forms the roof, walls and doors. Its glistening and distinctive shape is a landmark particularly for visitors flying into Adelaide. The Bicentennial Conservatory houses a display of lowland tropical rainforest plants from northern Australia, Papua New Guinea, Indonesia and the nearby Pacific Islands. 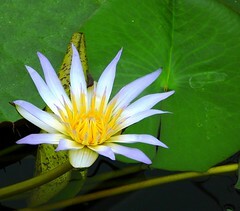 Many of these plants are at risk or endangered in their natural habitats. A lower walkway winds across the undulating forest floor and an upper walkway takes visitors among the canopy of tropical trees and palms. 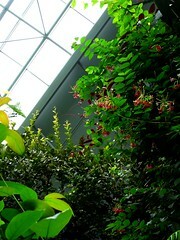 While we were in the botanic gardens I also of course took billions of other photos. Really – billions. I only uploaded 37 to Flickr (yes, v restrained; excellent progress); you can see them all here if you prefer. And it was raining – really bucketing down! But the gardens were just so fantastic I really didn’t care! We finally got back to the car and made our way to Ikea. Scott was obsessed with some vases, and I decided to get the lamp I’d loved. Hmm. . Ikea, around lunchtime on a rainy Sunday. I must say it wasn’t as pleasant as experience as first thing on a Thursday! There were people everywhere – so many I think they were defying physics and actually overlapping at some places. Then we had lunch. Scott went to battle for this one! Lunch was good, but then we couldn’t find a way out. It was a strange favourite dream/nightmare being trapped there! So I got out my death ray and eliminated everyone who was an annoying idiot (everyone except Scott and I it turns out) and we hightailed it to the car park. Then we filled up with petrol and dropped the car back at the rental company. We grabbed our stuff, then quickly packed up the bags for check-in. Even with our Ikea purchases we still could have gotten away with only one checked bag, however we had two so just checked them in. The awkwardest bit of baggage turned out to be the candelabra Scott had gotten at Ikea on our first trip there. We didn’t want to risk it in checked baggage, and it wouldn’t fit into carry-on. Nor would it fit into an overhead locker once we were on the plane. We wound up turning it upside down, fitting it in under the seats from the aisle side, then leaving it on the floor between our legs. The things we do for the love of candelabras. 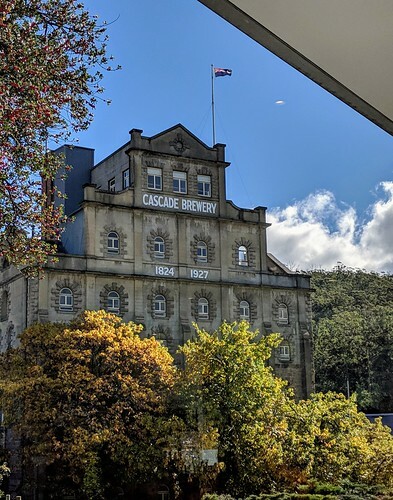 We had an almost 2 hour stop over in Melbourne – annoying as it’s long enough to get bored but not long enough to do anything – so didn’t get back to Hobart until 8.30 pm. We rescued the car, then headed to Lottie’s holiday house to rescue her. She was very happy to see us and saying hello on the front porch – then realised she could take herself for a walk/run. GRRHH!! So we headed off after her, and I caught her as she was making a run for it past a fence. Sigh. An odd ending to a very pleasant long weekend. ← SA Day 3: Happy 3rd Wedding Anniversary to Us!